Welcome to the Sands of Time! Before you face Grandfather Spider himself, you’ll have to fight your way through three formidable foes: Shadowbones, Bort Shadowmane, and the Shadowwock. Each boss is located in a different sigil area, but this guide will cover all three. The Grandfather Spider fight will be covered separately. Shadowbones is a lone shadow/death boss with 32,000 health. If you cast any type of feint, Shadowbones will interrupt to shout “Why Don’t We Trade!” and swap the two traps. The 70% trap will be put on you and the 30% trap will go on Shadowbones. If you use any type of heal, Shadowbones will interrupt to say “Let’s Dampen the Heals!” and cast a -75% Doom and Gloom. This can be replaced by another bubble. If ANYONE in the battle (that means your team OR Shadowbones!) uses some type of fairy (Pixie, Dark Fairy, Sprite, etc..), Shadowbones will shout “Fairy!” and cast a 20% Amplify on himself. The trigger for this is still unknown, but occasionally, Shadowbones will shout “Shadow-Shadow! I love Shadow!” and give himself one shadow pip. Use Melt and Indemnity if you want to feint. 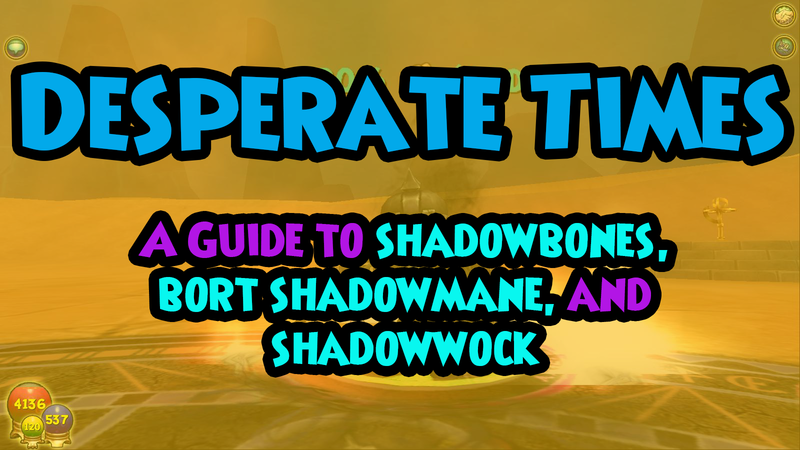 Since Shadowbones swaps feints with an ice spell, you can throw on a melt beforehand to dispel it. A protected feint with Indemnity will also work. If you’re worried about the Doom and Gloom, unequip healing pets. Although you can replace the Doom and Gloom with something else, one untimely pet heal and your big heals like rebirth or dryad may be ruined by it. 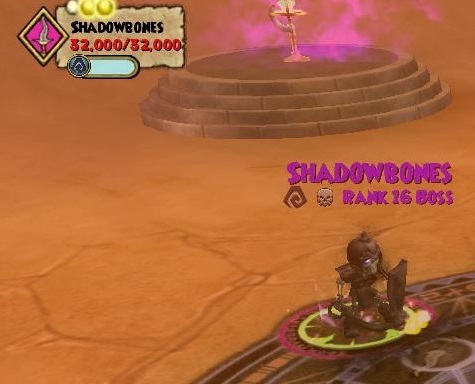 Other than that, you can treat Shadowbones like a normal boss! 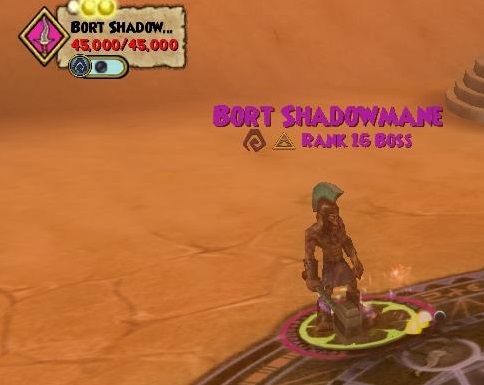 Bort Shadowmane is a lone shadow/myth boss with 45,000 health. If you hit Bort Shadowmane without killing him, he will interrupt to shout “Check Out My Armor!” and cast a protected Myth Absorb on himself. Make sure to kill him in one shot. This fight is pretty straightforward. As long as you kill Bort in one blow, you won’t have to worry about any absorbs. However, even if you do happen to fall a bit short, the absorb is standard and shouldn’t be a problem for you. Shadowwock is a lone shadow/fire boss with 51,212 health. The Cycle. Shadowwock runs on a cycle nearly identical to the original Jabberwock in Avalon. Every 3 rounds, a big shadow meteor strike will be cast + a 200% trap. Every 2 rounds, the Shadowwock will interrupt to remove all traps that are on him. Round Two: If there are any traps on the Shadowwock, he will interrupt to shout “Snicker-Snack!” and remove all of them at the beginning of this round. Round Three: At the beginning of this round, Shadowwock will interrupt to shout “You Make Me Frumious!” and cast a HUGE shadow meteor strike. This spell does roughly 2500-3000 damage. Immediately following that, the Shadowwock will place a +200% universal trap on himself. Round Six: The Shadowwock will shout “You Make Me Frumious!” and cast his big shadow meteor strike in addition to placing his +200% trap, but he will ALSO shout “Snicker-Snack!” and remove all traps that are on him directly after. Round Seven: Cycle repeats from round one. If you cast any type of feint, the Shadowwock will interrupt to shout “How Mimsy!” and swap the two traps. The 70% trap will be put on you and the 30% trap will go on Shadowwock. If ANYONE in the battle (that means your team OR Shadowwock!) fizzles, the Shadowwock will give himself 2 power pips. Bad Juju: You may not be able to dispel the shadow meteor, but you can lessen its blow with Bad Juju. You would have to play it on Round 2 in order for it to effect the cheat hit. You will only need 1 person to play Bad Juju if you’re playing from second, but you’ll need 2 people to cast Bad Juju on round 2 if you’re playing from first. Otherwise, your juju might be used up by Shadowwock during his regular turn. Legion Shield: This method won’t be as safe as Bad Juju, but Legion Shield is a more widely available spell and will still get the job done. Just like Bad Juju, you would only need 1 Legion Shield if playing from second, but 2 if you’re playing from first. After all, you don’t want all the shields to be used up by a regular AOE. Use an Indemnity Feint, but not on round 1. 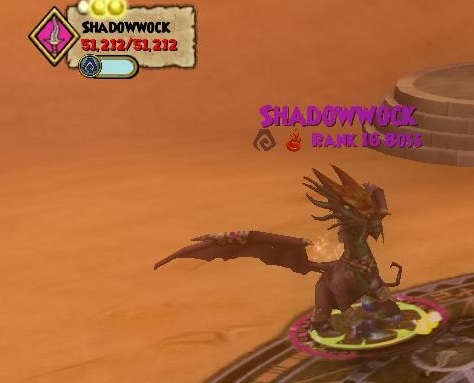 Since Indemnity is a protection spell, Shadowwock will be unable to swap the two traps. You want to avoid playing it on round one because the Shadowwock will cleanse all traps at the beginning of round two. You ideally want to hit on round 3. You only have a one round window to make use of that +200% trap (and it’s the same round as the meteor!). If you do this and have been blading your hammer the previous 2 rounds, you should have plenty of firepower to take Shadowwock out. With those 3 goons out of the way, time for the grande finale!